This is probably the last room in my house that I should be decorating, but it's small and cheap and I just keep thinking about it. So on I go. It's the half bath on the main floor, and is about as plain as they come. 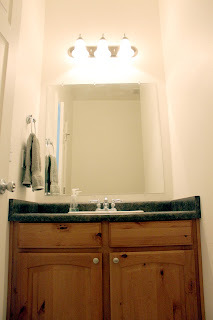 White walls, white trim, grayish formica counter-tops. Blaaaaaaah. Here's my plan. Grey horizontally striped walls (13" tall per stripe). Repaint cabinets white. Yellow accents (hand towel, wall-mounted magazine rack, artwork). I'm afraid a small yellow rug would get grungy too quickly, so I'll probably go grey on that. And then some pops of spring green (plants?) and maybe orange? 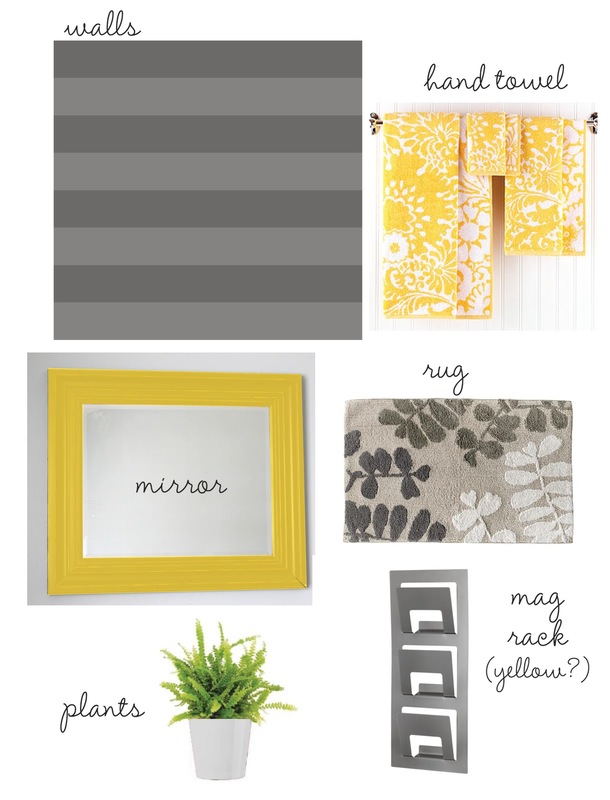 By the way, you wouldn't believe how hard it is to find a cute patterned yellow rug or hand towel. And it's hard to find many options for a very small rug too (even in grey!). They are mostly just solid bath mats. So if anyone has any suggestions of places to check out, I'd love to hear them! So, I wanted to use this great mirror I inherited from my parents, whom I believe inherited it from my grandparents. 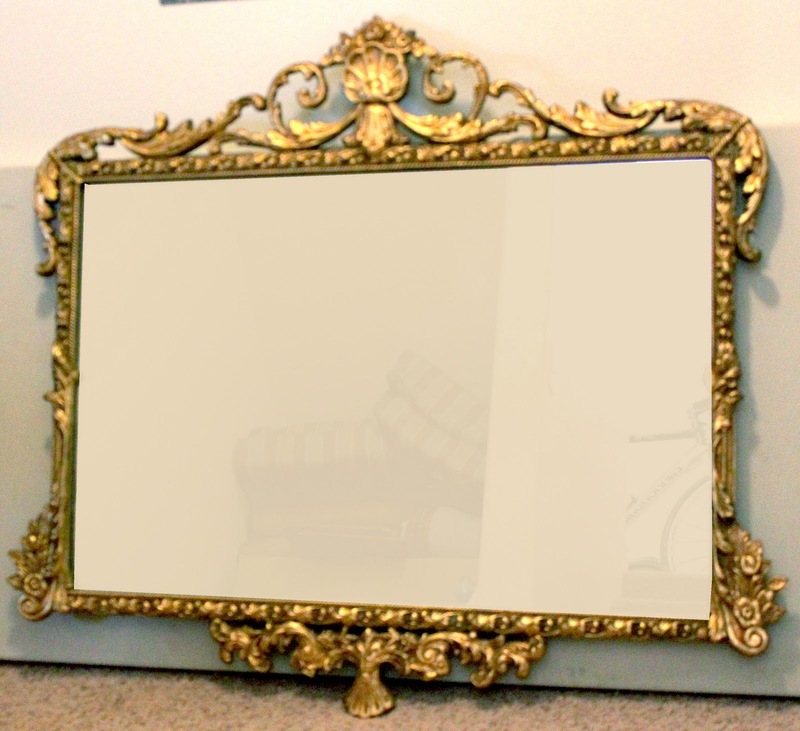 I was going to paint the frame all yellow (is that a crime? ), but was devastated to discover that it is about a half inch too wide for the room! 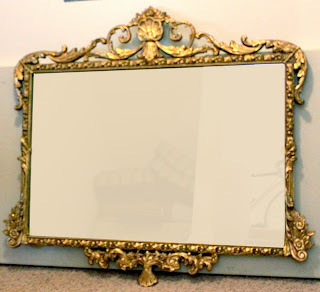 After some disappointing shopping trips, I've decided instead to use this mirror from my bedroom and paint the frame yellow. 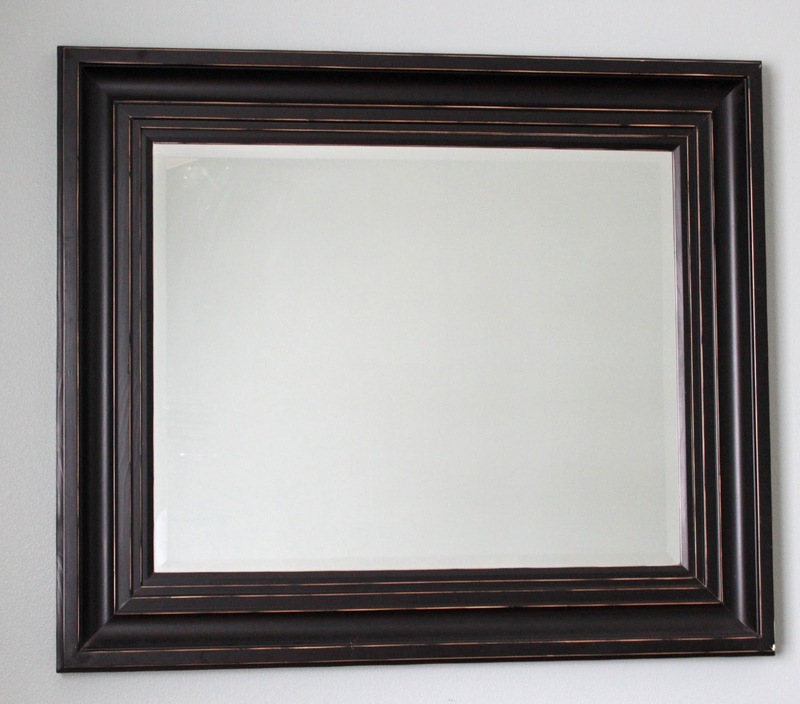 It will replace the flat mirror currently over the sink. Or at least that was the plan until I discovered that rug is no longer available and the towels are the only one on the website where the hand towel is not offered. Now what? I swear I've searched high and low. I'm going to go ahead and paint anyway. If you've seen any great yellow or grey rugs and hand towels, please let me know where! Love the color choices and the plan. :) Our bathroom was super boring and we painted it the same blue as our living room. I'm kind of bored of it though. Anyway, maybe you could paint a rug and/or sew one out of two existing solid rugs? What a cute idea. I'm lost when it comes to decorating bathrooms. It's always last on the list and by the time I get to it it's time to move again :D. One of these days we'll stay in one area for 3 years and buy a home that I can do whatever I want to it! 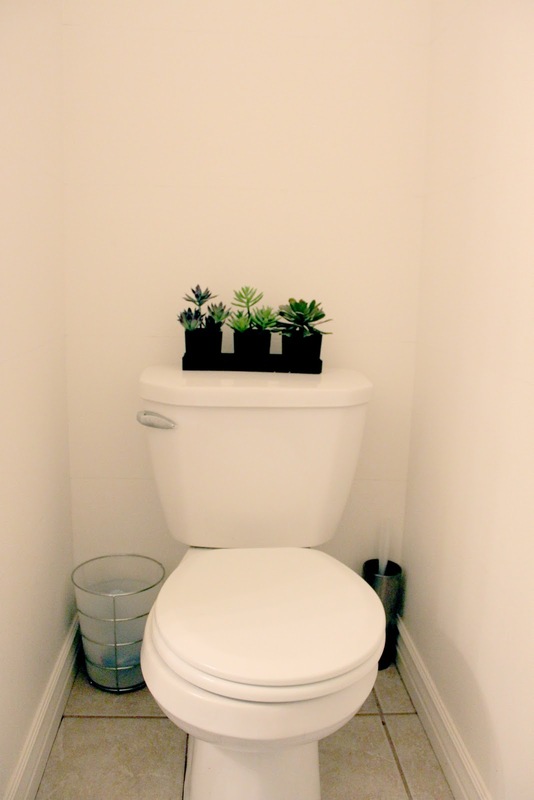 Like it :D. Have you thought about doing a yellow pot for the plant? Or maybe white and yellow? Great ideas. I like the idea of painting a rug. like a braided rug or something. It's too bad you are so far away. I would love to bounce decorating ideas off you.